I don’t like math very much – it’s like bad tasting medicine. I need it to get through life, but I don’t have to like it. It wasn’t always that way. I loved school from the very beginning. In fact, I couldn’t wait to go to “real” school where I could get homework. On the first day of first grade, my mom arrived at school just as I was coming out of the cafeteria from lunch. “Mom, you need to come back later, I have a whole half a day left! Please don’t make me go home now.” You see, I was supposed to walk home for lunch and never arrived. She must have been so worried and then crushed that I would want to stay at school instead of coming home to eat with her. I was the oldest, so I am sure she was struggling with her baby growing up. Reading and writing were my very favorites – and that has never changed. Math wasn’t my best friend, but I liked learning it. It was an easy companion and useful to know. Then came Mrs Dunbar and multiplication. Seriously, my brain just didn’t work that way. Suddenly, math was the class I dreaded. It took a year, but we made peace and I was once again ambivalent about math with the occasional times table nightmare. The big fracture came a few years later – in the form of algebra. I just thought multiplication was bad. Suddenly I was looking at a+b=x. WHAT! Even worse, they added an element of multiplication, 3a+6b=x. I hated algebra and dreaded the rest of high school if this was what I had to look forward to for the next four years. And then came geometry. I didn’t have much hope for my new math class called geometry – after all, algebra was supposed to be a new, fun way to do math. Algebra had betrayed me, but geometry quickly became a trusted friend. I loved the theorems and formulas, the lines and shapes, the simple logic of it all. I think it spoke to the artist in me that wouldn’t be uncovered for almost 20 years when I took my first art class in college. 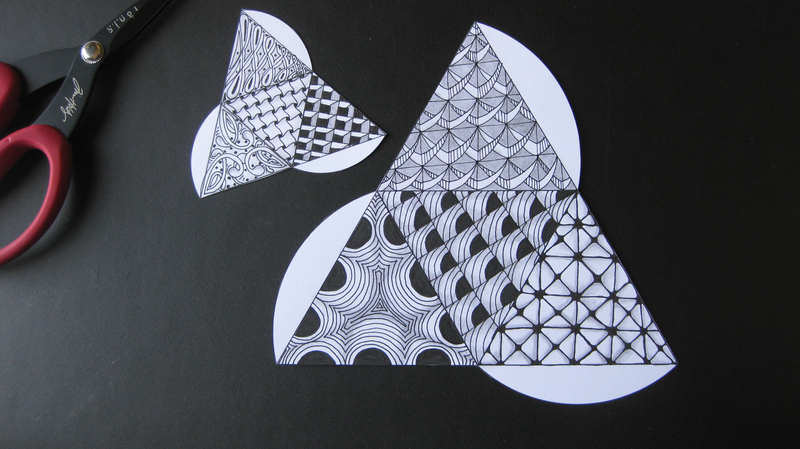 Zentangle reminds me of my old friend geometry. I especially love tangles with straight lines, pure geometric shapes, and optical illusions made up of only simple shapes. While I love the very organic tangles, and work hard to perfect them, it’s those grids and lines that allow me to lose myself while tangling. Imagine my excitement when I found templates for geometric solids on the web. How cool is that? Perfect triangles begging to be tangled and then turned into a solid object. 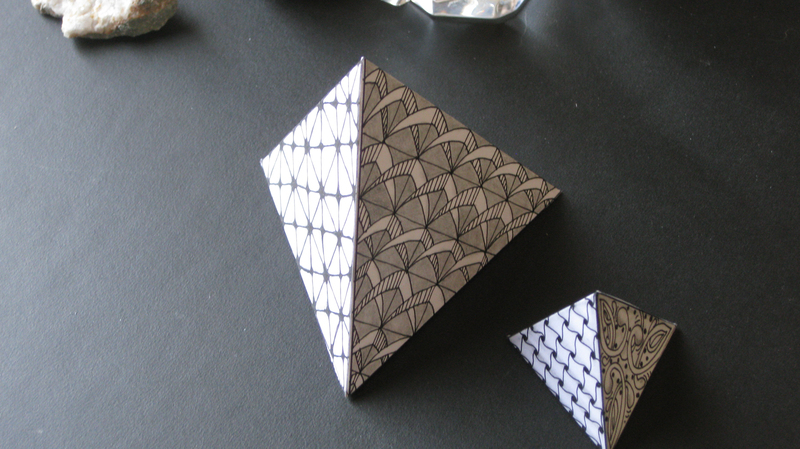 Zentangle and geometry in one tidy little package, a perfect pair. I love them both. How about you? What a comforting story. Your sharing is appreciated! The 3D tangles are gorgeous! Can you share where you found the patterns? Thanks Mary – the website is http://www.auntannie.com. It was a geometric solid project. There are a total of three different templates. Kathy – this is wonderful! Your whole site is great, but I too love the geometric tangles and can’t wait to look up the templates to try for myself. Thanks for posting the link!